Dynabeads Tyre Balancers. The dynamic way to balance your bike tyres. For a glass smooth ride! No more ugly weights to corrode and damage expensive rims. 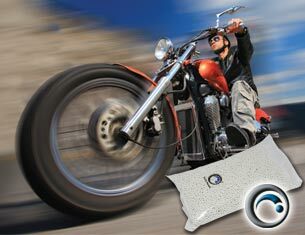 Dyna Beads are easy to install. Dyna Beads can be used with tubes or tubeless tyres and are effective even for scooters. Dyna Bead tyre balancers are 100% enviromentally friendly ceramic. Impervious to moisture, and non-abrasive to inner liners or tubes. No special air drying is needed. Dyna Beads tyre balancers can be installed at the time of tyre mounting, or after, through the valve of the stem. All kits are pre-packaged in Dyna Beads branded packaging. Can I fit Dyna Beads into my Triumph's 90° tyre valves? *Piaggio MP3, Pia 150cc Trike, Yamaha Tricity etc. These codes are typical for Harleys but can be for any tyre. The codes do not go beyond 150mm in width. With these tyres, the first number of the tyre size is not the actual width, it is just a number. The M-code is what tells you the actual width. **Rim locks - the quantities above have 1 ounce added over what you normally use to accomodate the additional weight of the rim lock. Two rim locks opposite each other don't require any more Dyna Beads than those stated above as they have a tendency to cancel each other out. Quickly find the perfect kit for your bike using this calculator.